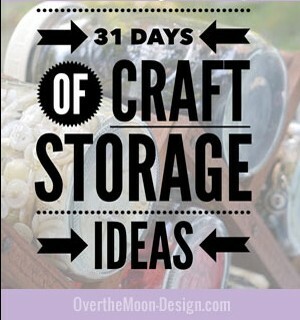 Welcome to 31 Days of Craft Storage Ideas! I’m thrilled to be a part of this challenge for the first time in the massive link party hosted by The Nesting Place and 31 Days. 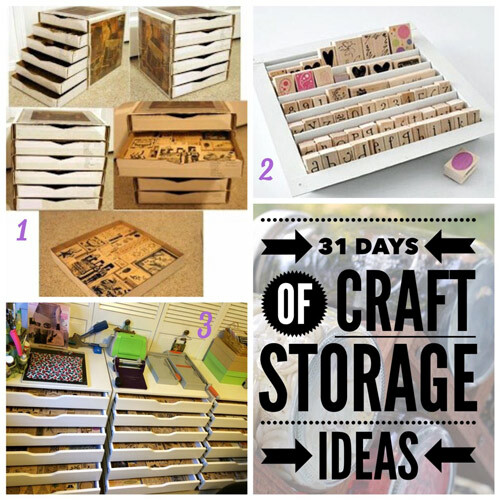 Why 31 Days of Craft Storage Ideas? It wasn’t really difficult to think of a topic for the 31 Day Challenge. One of my favourite pet subjects is storage and, as a bit of an ADHD crafter, I tend to accumulate lots of craft supplies. Storage is at a premium in our little cottage in the hills of Adelaide and unfortunately I don’t have a space of my own to dedicate to all things crafty. One day, when I’m an empty nester, I’ll turn one of the bedrooms into my studio. 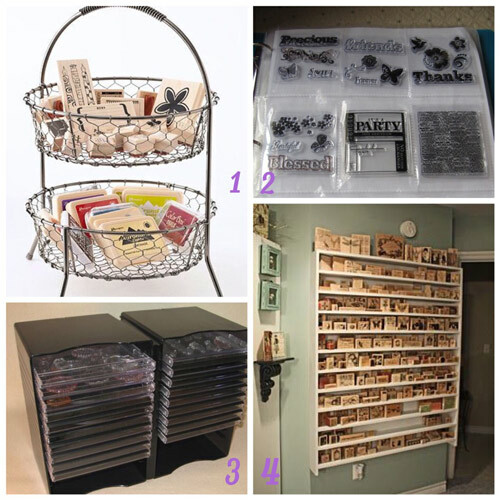 Until then I’ll share with you some clever storage solutions for your craft supplies, some of them store-bought, others DIY and still others recycled or repurposed. So we are at the start of 31 days of non-stop blogging. I really hope I can do it, I have a list of about twenty post ideas already. First up this week is storing Scrapbooking supplies. 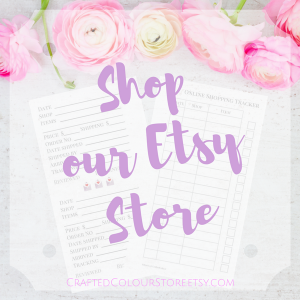 Please feel free to comment here, on Facebook or on a post if there’s a craft tool or supply that you need storage ideas for. I’m happy to research and write a blog post about it. The posts I’ve planned include storing craft supplies for many crafts including Fibre Arts (knitting and crochet), Jewellery Making, Digital Scrapbooking, Needlework, Drawing and Painting, Sewing and Quilting and sharing a few of my favourite craft studios and blogs. To kick off this series, a taster so to speak here are three of my favourite craft room/studios. There’s storage ideas for everyone, and I hope you will visit my blog during October to read the latest posts in this series! Hi and welcome to Over the Moon. This month I’m joining in on a month-long blogging project created by The Nester, you can find the rest of the participants at 31 Days. 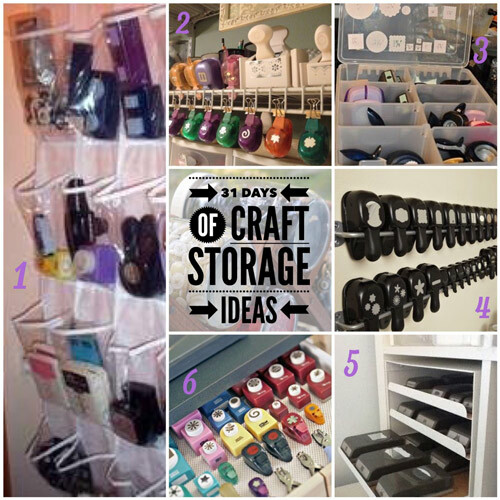 This is day three of 31 days of Craft Storage Ideas. Storage is at a premium in our little cottage and unfortunately I don’t have a craft space of my own. One day, I’ll turn one of the bedrooms into my studio. Today we are looking at paper punches which can be tricky to store because of their size and weight. Creating Keepsakes shows how to use a towel rail to hang punches and suggests attaching a strip of ribbon or felt to protect the wall from the punches. Finally, if you prefer to keep your punches out of sight, store them in a drawer with a non-slip mat liner as suggested by Better Homes and Gardens. 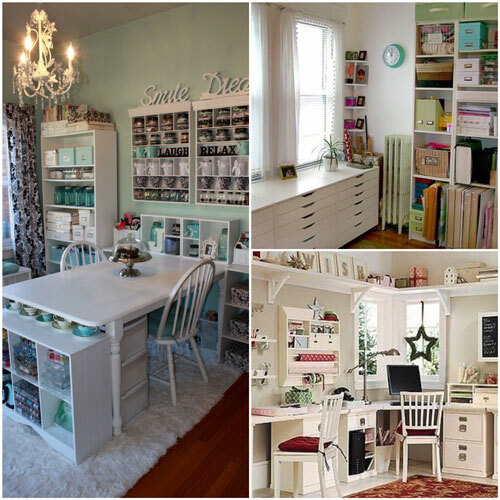 This would be ideal if your craft room doubles as a spare guest room. If you’ve found other ideas for paper punch storage let me know in the comments or by using the contact link at the top of the page. Hi and welcome to Over the Moon. This month I’m joining in on a month-long blogging project created by The Nester, you can find the rest of the participants at 31 Days. 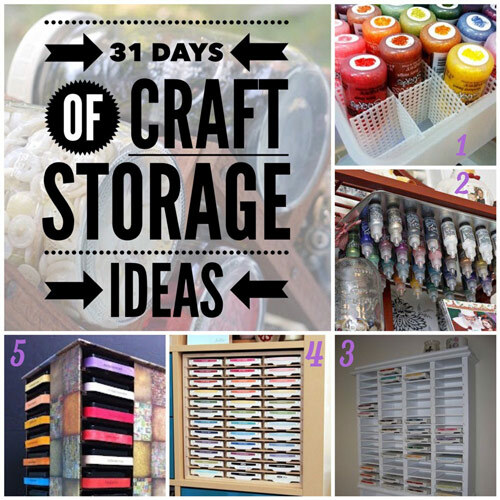 This is day four of 31 days of Craft Storage Ideas. Storage is at a premium in our little cottage and unfortunately I don’t have a craft space of my own. One day, I’ll turn one of the bedrooms into my studio. Here are some ideas to store both the wood mounted and the clear stamps. Repurpose a wire basket and replace the fruit you would normally store in it with stamps. This would be ideal for stamps that you regularly use. 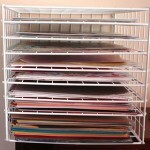 I love this idea by ScrappinXOXO to keep small clear stamps in baseball card sheets in a folder. Lori of Clearly I Stamp shows a couple of ideas for storing your stamps. 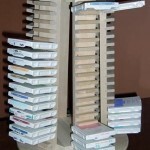 This one uses clear CD cases and a CD rack. If you have a lot of wood mounted stamps why not create a wall of stamps like Kim of Dragonfly Dreams. This is definitely worth reading as Kim shares lots of lovely photos of her new studio, along with a gorgeous chandelier! I found these three other ideas this morning and had to include a DIY, a repurposed item and the obligatory IKEA contribution. Here’s a clever idea from Scrapbooks etc to re-purpose an air vent cover. If you’ve found other ideas for stamp storage let me know in the comments or by using the contact link at the top of the page. Hi and welcome to Over the Moon. This month I’m joining in on a month-long blogging project created by The Nester, you can find the rest of the participants at 31 Days. 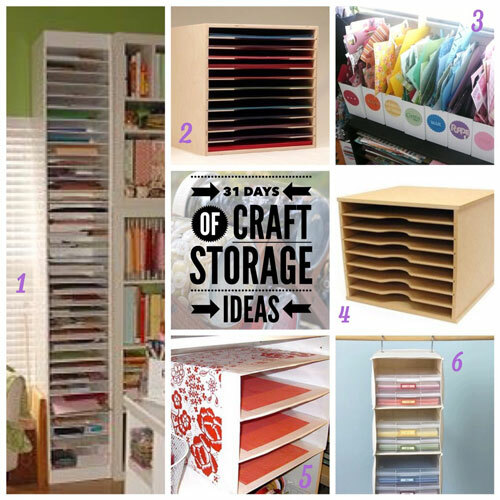 This is day five of 31 days of Craft Storage Ideas. Storage is at a premium in our little cottage and unfortunately I don’t have a craft space of my own. One day, I’ll turn one of the bedrooms into my studio. Here are some ideas to store both the stamp pads and ink bottles. Keep your stamp pads off the desktop and up on a wall with this DIY wooden shelf unit from Did You Stamp Today? Finally, time to hit the yard/garge sales and see if you can find an old style audio cassette carousel. It seems they are the perfect size to store ink pads. This ideas is courtesy of Split Coast Stampers. If you’ve found other ideas for ink storage let me know in the comments or by using the contact link at the top of the page.